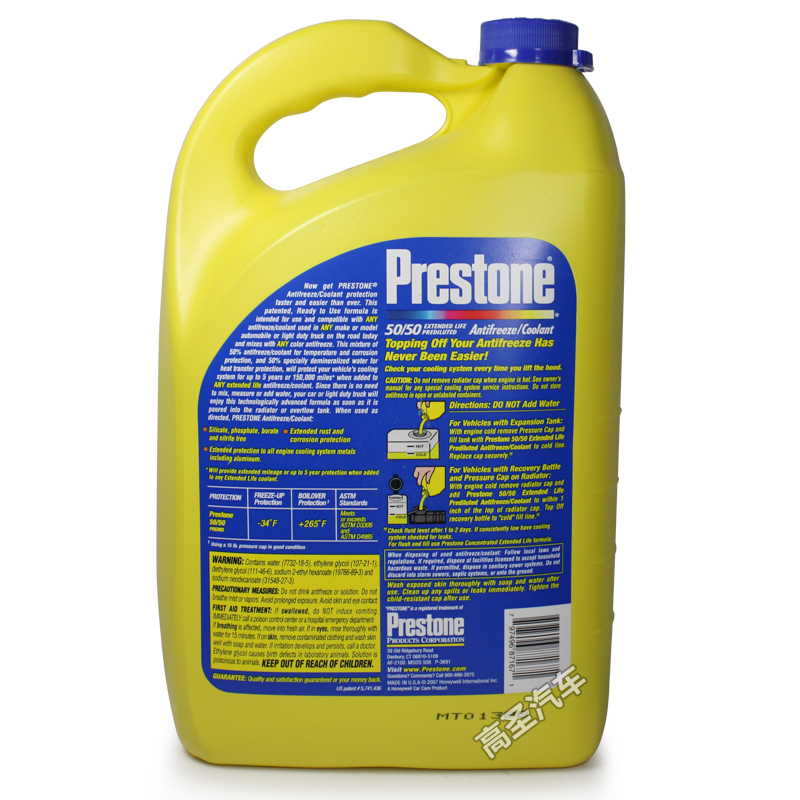 Propylene glycol, is considerably less toxic and may be labeled as “non-toxic antifreeze”. It is used as antifreeze where ethylene glycol would be inappropriate, such as in food-processing systems or in water pipes in homes where incidental ingestion may be possible. Propylene glycol oxidizes when exposed to air and heat, forming lactic acid. If not properly inhibited, this fluid can be very corrosive, so pH buffering agents are often added to propylene glycol, to prevent acidic corrosion of metal components. Besides cooling system breakdown, biological fouling also occurs. Once bacterial slime starts, the corrosion rate of the system increases. Maintenance of systems using glycol solution includes regular monitoring of freeze protection, pH, specific gravity, inhibitor level, color, and biological contamination. Propylene glycol should be replaced when it turns a reddish color. From Wikipedia article Propylene Glycol. The question you should be asking is: What’s Anti-Freeze doing IN my shampoos, deodorants, cosmetics, lotions and toothpaste? Yes, the main ingredient in anti-freeze is in all of these products. You need to understand what it could do to your health? Anti-Freeze * Brake and Hydraulic Fluid * De-Icer * Paints and Coatings * Floor Wax * Laundry Detergents * Pet Food * Tobacco * Cosmetics * Toothpastes * Shampoos * Deodorants * Lotions * Processed Foods and many more personal care items. Check out your body lotions, deodorant, hair conditioner, hair gel, creams, and many more products! Propylene Glycol serves as a Humectant; a substance that helps retain moisture content, or simply it prevents things from drying out. That’s why some pet foods are soft and chewy. This, of course, is a good reason it’s in cosmetics and other personal care items. It makes the skin feel moist and soft. And, the products don’t dry out. Propylene Glycol is also found in baby wipes and even some processed foods! Go Ahead, check your labels! A published clinical review showed propylene glycol causes a significant number of reactions and was a primary irritant to the skin even in low levels of concentrations. What can PROPYLENE GLYCOL Do To Us? In 1938, the FDA grandfathered the use of several ingredients as safe for personal care items, with restrictions of course. Based on what? There were no studies on repeated exposure over time. The problem is PROPYLENE GLYCOL may be absorbed through the skin. Studies have shown SYSTEMIC retention (residue throughout). NOW THIS OPENS UP A WHOLE NEW BALL GAME! Has anyone or any company tested the long-range side effects from constant use of these products? We haven’t found any. Do these complex chemicals build up in our bodies? If Propylene Glycol keeps things from drying out? How? If it’s absorbed into our bloodstream and into our cells, what does it do? Does it affect any of the simple, natural biological functions at the cellular level? You don’t need a study to say it’s possible, even likely. You do need a conclusive study to make the producers stop using these ingredients! Yes, this is beginning to sound like another great American Tobacco Scandal. But before you get complacent and think the government is going to step in – think again. Look how long it has taken the cigarette pushers to get grilled. 20 years after the first Surgeon General’s report! Propylene glycol is also used as a solvent in acrylics, stains, inks and dyes, and in cellophane and brake fluid. It is used as a preservative in flavored coffees. PG can have an anesthetic effect. Other side effects on animals exposed to PG include heart arrhythmia, stunted growth, decreased blood pressure, and even death. “Propylene glycol is one of the most common humectants. It is used in many cosmetics including liquid foundation makeup, spray deodorants, baby lotions, emollients or moisturizers, lipsticks and suntan lotions. It is less expensive than glycerin and has a better permeation rate. It has also been linked to sensitivity reactions — local irritations, allergic reactions. This would not be news to the manufacturers of propylene glycol. If you were to purchase a drum of this chemical from a manufacturer he is required to furnish you with a material safety data sheet (MSDS) and it may alarm you to find that this common, widely used humectant has a cautionary warning in its MSDS that reads, “If on skin: thoroughly wash with soap and water!” What? Aren’t we putting this stuff on our skins daily, sometimes in copious amounts over long periods of time? Despite its record, propylene glycol continues to appear in our everyday products. It was originally developed for use in industry as an anti-freeze, brake fluid, airplane de-icer among other applications and it’s doing a good job there. What would you do if you were the Big Cheese at PROPYL & GLYCOL with corporate profits to fatten? You probably wouldn’t offer to do a study and you sure wouldn’t change anything else without being able to justify additional costs to your stockholders. And if you think Anti-Freeze ingredients in your expensive cosmetics and personal care items is disgusting. It’s just the tip of the iceberg! How it got into our cosmetics 30 years ago is anyone’s guess but it’s time it was taken out of our personal care products and kept off our bodies!